Christmas Animated Background. Santa rockets along in his magical sled. 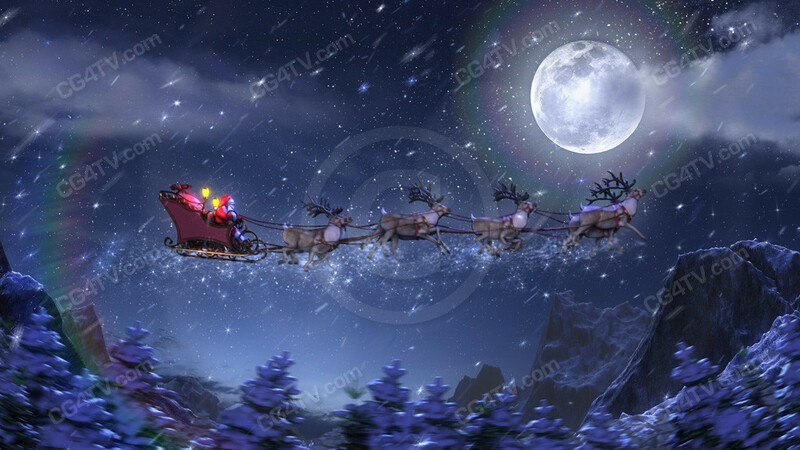 Santa rockets along in his magical sled drawn by eight tiny reindeer. EXCLUSIVE product. Christmas Animated Background is only available from CG4TV.com. We don't have resellers or representatives. This product that can not be purchased elsewhere. Christmas Animated Background. He’s known as Santa Claus to some children, or Santa for short. Some know him as Father Christmas, or Saint Nicholas or Kris Kringle. Whatever you call him, the image in our Christmas Animated Background is unmistakable. 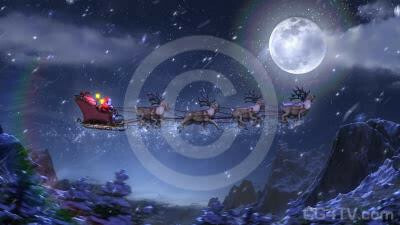 Santa rockets along in his magical sled drawn by eight tiny reindeer. He hurtles through the snow and skims over the trees, guided by a brilliant moon. He’s on a mission to bring presents to children the world over. Soon, he’ll alight on a roof and glide down a chimney, a bulging bag of toys thrown over his shoulder. But not before he’s checked his list – twice – to see whether the children in this house have been naughty or nice! The Holidays are coming! Think of the ways you can use our seamless loop, high definition Christmas Animated Background animation. Call forth the spirit of the season. Evoke the joy of Christmas. Our charming, premium quality, high definition animation inspires the best memories in all of us. Let your imagination be your guide in how you use our high definition Christmas Animated Background animation. And remember, all our animations are available in a variety of sizes and resolutions to meet your needs. Why spend money and time developing a custom animation? Royalty free use of this low cost Christmas Animated Background animation will be easy on your wallet and on your busy schedule. It’s the most delightful Christmas Animated Background animation you’ll find. Why wait? Get our Christmas Animated Background now. It’s easy. Just a few simple clicks of your mouse and you’re ready to go. Download is immediate. All major credit cards are accepted.